Glen lives in the Pacific Northwest and some incidents and geography reflect it. He has also worked in over 30 countries - providing a rich source for fictional, larger-than-life character development. 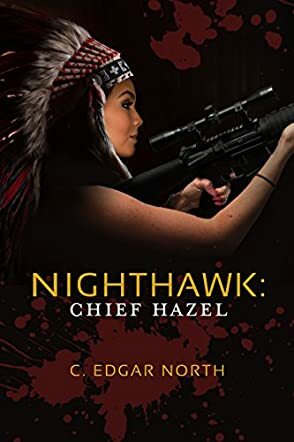 Nighthawk: Chief Hazel by C. Edgar North is a novel that will undoubtedly tantalize readers who love character-driven stories; it is a compelling tale involving drug dealers, arms trafficking, murder, and a couple who will fight all odds to stay together and to protect their clan. Chief Hazel takes over the leadership of her clan from her husband who is on the run for murder — and who would have to answer for a number of other crimes. While her husband is away, heavily involved in arms deals and trying to stay a step ahead of the FBI, Hazel becomes a powerful smuggler across the Pacific Northwest. But things aren’t meant to run smoothly for her. In a bid to coerce her into smuggling something into the US, North Korea kidnaps her daughter. The twist is what will blow the reader’s mind. One of the things that caught my attention is the international setting, for it is not often that we read crime fiction set across the seas and involving characters drawn from different cultures. The author must be a sailor or he must have done a great deal of research to write so expertly about the art of seafaring. The plot is fast-paced and there is a nagging sense of suspense built around the shifts in scenes. The fact that the FBI watches Joseph very closely without his knowledge makes the reader itch to find out if he’d make a stupid mistake and get caught. Nighthawk: Chief Hazel is well-written and the author’s confidence comes across in his ability to create a balance between “telling” and “showing.” Readers will also enjoy the dialogues that ring through with originality. This is the first book I have read from C. Edgar North, and it is indisputable that the author knows how to make readers love and care about his characters; he establishes a signature for intrigue and entertainment. Now I will have to go back and look for the prequel to this one; it is a great success. In a exciting and adventurous new read from author C. Edgar North, Nighthawk: Chief Hazel, the second installment in the Nighthawk series, readers will find a story that will keep them obsessively turning the pages from the start all the way through until the very end. Follow the story of Hazel Branson as she replaces her husband, Joseph, as the Chief of the Midlake First Nations Indian band, earning respect and admiration for her leadership skills; not an easy feat for a woman in a role traditionally held by a man. Joseph is wanted by the FBI for smuggling, but has continued with his operations, teaming up with a variety of nefarious characters. He is unaware that the CIA is watching him, and has been able to learn a lot from his movements, making him a highly valuable asset. When Hazel's daughter is kidnapped by the North Koreans, she is willing to do anything, even killing, to get her back. Will Joseph and Hazel find success in their dangerous aims? You'll need to read the book to find out! I very much enjoyed Nighthawk: Chief Hazel. Author C. Edgar North has done a great job of creating characters that his readers will find realistic and will be able to highly engage with. If those aren't hallmarks of a great author, I'm not sure what is. Any reader who enjoys a thrill ride of a read, filled with plenty of action and adventure, would certainly enjoy this book. I am pleased to be able to recommend it, and look forward to reading more from C. Edgar North in the very near future! Nighthawk: Chief Hazel is the third book in a series featuring Hazel and Joseph Branson, a married American Indian couple who lead the Midlake First Nation Indian band. Joseph is an ex-Navy Seal wanted by the FBI for smuggling and murder as by-products of his smuggling business in arms, drugs and raw diamonds. Working with a Russian arms dealer, he travels to India, Sri Lanka, Central Africa and Columbia. Unbeknownst to Joseph, the CIA has been observing his movements and gleaning valuable intelligence they hope will prove useful in parallel operations. During Joseph’s absence, Hazel takes over the family smuggling business in the Pacific Northwest, but she runs into serious problems when North Koreans kidnap her daughter and force her to smuggle saboteurs into America until Joseph returns to save the day. C. Edgar North writes with authority on the subjects included in this story. From military tactics and weapons to smuggling operations on both sides of the fence, the criminals and those who hunt them for prosecution, North knows his stuff. His narratives, dialogue and imagery create a fast-paced, multi-tiered adventure that will keep the reader turning the pages. The author’s style of jumping into a scene without setting the stage and introducing a multitude of characters, that may or may not appear anywhere else in the story, was confusing. But, that’s just me. I have a thing for verisimilitude and C. Edgar North gets an A+ in that and the technical skills of grammar, sentence structuring and plotting. All in all, a great read that I wholeheartedly recommend for all fans of an adventure thriller story.